Agile project and Agile project management is an iterative and incremental method which provides help in designing and develop the activities for producing better products, rendering best services as in all fields life or sectors of the different business which might be related to engineering, marketing, management or information technology. It is a value driven approach which focuses on high-priority, high-quality products’ designs as well as their development with low level of tolerance with erroneous or costly techniques of project management that compromises wither quality, functionality or budget which are vital for product, software and services to be recognized as successful. Agility is a unique feature which captures the idea and then translates into real product or services in efficient manner with the best path way that routs to minimization of cost, time and increase in the value. This all require active response and excellent skills of project management that leads towards the agility. All that is possible with the help of Agile project management skills that enable the engineers, developers, IT experts and technicians to become master in their relevant disciplines. Agility and value driven are demanding approaches where project and product management are required from idea generation to commercialization stages. So, Brainmeasures program of Agile project management certification is the best choice to cater the needs of rapidly changing environment and demanding skills in the field of project management. This online certification will equip you with the best practices of project management and enable you about how to become more efficient and effective managers, engineers and expert in assessing the idea conception, requirement analysis, designing, production or manufacturing, testing, quality champions and successful commercialization of developed product or service with the help of agile project management techniques. Apart from learning of different project management techniques and modelling with the application of agile approaches, you will also be assessed with online exam and assignments that will be provided to you by the end of different topics in the certification program. This will definitely an assessment of your skills, knowledge and experience that will not enable you to find the missing paths and commons areas in these three but also equip with you the additional expertise that you might be required to become a successful businessman, engineer, an entrepreneur, manager, developer, marketer or IT expert. As this certification holds its multidimensional and multidisciplinary application, therefore expected salary will be varied according to each industry and field of the certificate holder. However, an average expected salary for Agile Project Management certification holder is expected around $85,000-$150,000 per year which varies according to the nature of business, related field and reputation of the company in the related field, level of competition as well as experience of the individuals who are providing their services or employed in different companies that belong to different industries. 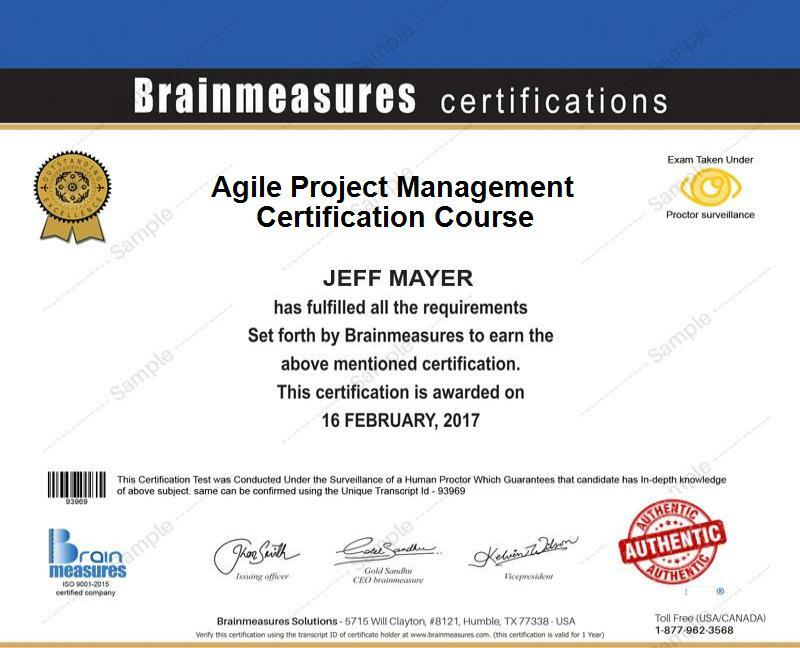 Agile project management certification from Brainmeasures is a unique certification in the fields of project, product and services management that is supposed to provide information, expertise and knowledge about the emerging field. Scope of this certification is very wide and prevails to lot of industries. Beneficiaries of the certification can be from IT industry, manufacturing or service world as well. Agile project management certification course from Brainmeasures is exclusively designed for engineers, software engineers, data analysts, project developers, project/product/service managers, entrepreneurs, professionals and for all those individuals who wish to enhance their project/product/service management skills with the new efficient and effective designs and frameworks that are reflected by Agile paradigm in the respective fields of experts.